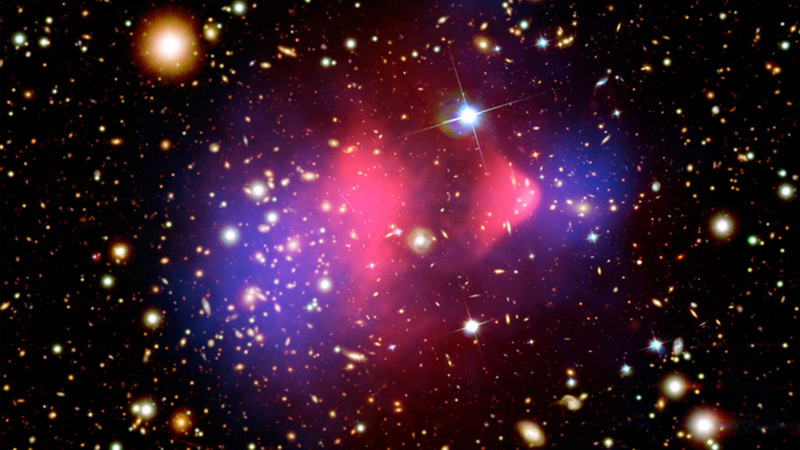 The Bullet Cluster Image: X-ray: NASA/CXC/CfA/M.Markevitch et al. ; Optical: NASA/STScI; Magellan/U.Arizona/D.Clowe et al. ; Lensing Map: NASA/STScI; ESO WFI; Magellan/U.Arizona/D.Clowe et al. It can be easy to take hyped-up science papers as fact, especially when they involve the most esoteric imaginable ideas. But scientists are taking issue with a hyped-up new paper that claims it can eliminate the need for dark matter or dark energy in our Universe. Observations of our Universe imply that something like 95 percent of it is comprised of mysterious stuff. The math says it could be explained by an invisible mass called dark matter, and energy causing the Universe’s expansion to speed up called dark energy. Here on Earth, no one has directly detected what dark matter and dark energy are made of, which is causing some worry. That includes a new, widely-shared paper proposing an alternative idea. The paper says that one of the problems that is solved by the presence of dark matter and dark energy—the difference between how a galaxy should rotate according to the laws of physics and how galaxies rotate according to our observations—could instead be solved by tweaking the mathematics scientists have developed to explain the behavior of space and time. Lots of scientists think that this flawed idea didn’t deserve the hype. The paper’s hype probably stems from how the internet disseminates science news. The hubbub began with an uncritical press release from the University of Geneva about research from their scientist André Maeder. Perhaps, Maeder proposes, one of the core tenets of Albert Einstein’s theory of general relativity are wrong under certain conditions—in large voids where there isn’t any mass. Maybe, he proposes, reconsidering the mathematics governing the very fabric of the shape of space will eliminate the need for dark matter and dark energy. Eliminating the most important topics in physics with some math sounds incredible, so a few news outlets, most notably Newsweek as well as the usual suspects like the Daily Mail and IFLScience, ran with the story without calling outside sources. If they had, they’d probably have found out that many physicists don’t think Maeder’s idea holds water. Several, including Stanford dark energy physicist Andrei Linde and Yale dark matter physicist Priyamvada Natarajan, told Gizmodo that it wasn’t worth writing about (despite the fact that it ended up in the fairly prestigious Astrophysical Journal). Anže Slosar at Brookhaven National Lab confirmed Hossenfelder’s report. In its simplest form, he told Gizmodo, “The main thing that gives it away is that the paper doesn’t contain a ‘Lagrangian.’ A Lagrangian is like a basic mathematical object that defines a theory. We simply don’t know how to do theoretical physics without having a Lagrangian.” He also said that the idea doesn’t make testable predictions, something that many physicists treat as a requirement. More about that here. For what it’s worth, Maeder agreed that his “equations are underdetermined,” in an email to Gizmodo responding to Hossenfelder’s post. He pointed out that he felt his interpretation of some cosmology’s core tenets revealed interesting new results. Re-formulating the mathematics Einstein’s theory of general relativity isn’t such a new thing—lots of scientists have considered that maybe we observe dark matter and/or dark energy because something is missing, somewhere. Except no matter what happens, experimental evidence continues to confirm that Einstein’s theory of general relativity is consistent, regardless of what scientists throw at it. Why did the under-developed theory get so much press? The paper, alongside its flashy headline, was promoted to a large audience via the Phys.org press release aggregator (which does sometimes write original stories). Content mills picked it up without checking whether or not it was worth writing about—or wrote it regardless. It’s important to challenge the scientific status quo, of course. However, scientific advancement requires evidence, robust mathematical theories, and a cohesiveness that scientists do not think Maeder’s theory offers. So, for now, dark matter and dark energy are both alive and well. Which is to say, we don’t know what they are—but they’re still mysteries physicists are working to solve.